ZIGEM WOREDA, AMHARA REGION, 06 OCTOBER 2017 – “I went to the police station when my parents told me that I am getting married,” says Mestawet Mekuria,14, a 7th grader in Ayti Primary School, Amhara region, northern Ethiopia. She is also among 20 girl students who have been rescued from getting married in the school. Mestawet went to the police assuming that her parents will only be warned seriously. But it was much more than that. Her parents were arrested and imprisoned for two weeks for violating the law. 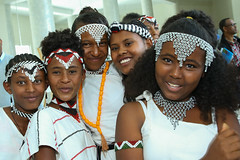 Child marriage, a formal marriage or informal union before age 18, is prevalent across all regions of Ethiopia. 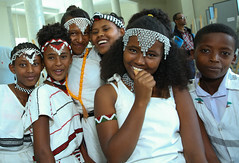 According to the 2011 Ethiopian Demographic Health Survey (EDHS), Amhara region has the second highest rate of child marriage, 56 per cent, next to Benishangul-Gumuz region which has 58. Although, Mestawet’s parents were angry for what happened to them, later they made peace with her through a mediation which was led by village elders. “My parents now understand about child marriage and its consequences. They are no longer angry with me,” says Mestawet. Child marriage often perpetuates an intergenerational cycle of poverty. When girls get married at early age, their prospects for a healthy and successful life will be at stake. Evidence shows that girls who marry early are less likely to finish school and more likely to be victims of domestic violence and abuse. In addition, young teenage girls are more likely to die due to complications in pregnancy and childbirth than women in their 20s. Strengthening girls’ club as part of the accelerated effort to end child marriage in Zigem woreda, Amhara region was initiated in 2015 by the Bureau of Women and Children Affairs (BoWCA) through support from UNICEF-UNFPA Global Programme to Accelerate Action to End Child Marriage. The ending child marriage programme focuses on enhancing the capacity of girls through providing life skill training, information about their rights and available services as well as enhancing the responsiveness of schools and legal services. It also targets families and communities to change their attitude towards ending the practice and show support to alternative life options for girls such as their education. Girls’ clubs are established with the aim of preventing and mitigating school based and community based barriers to girls’ education. The clubs are making a difference in reducing child marriage by empowering girls through life skills trainings. The clubs particularly focus on engaging girls between 5th-8th grades as these represent the age group most commonly affected by child marriage. Even though girls’ clubs are currently promoting change in schools where they are active, there are still many challenges. “Budget constraints hinders the effort to expand the exemplary role that the clubs are making in schools and communities,” says Abebe. “We have many primary schools that do not have such a functional structure like Ayti and we need more support,” he added. 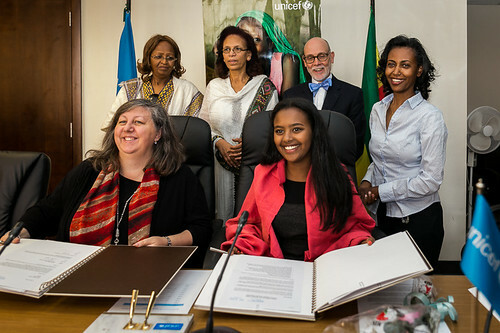 Nationally, the Government of Ethiopia has made a commitment to end child marriage by 2025 through enhanced coordination, budget allocation, accountability mechanism and availability of data. The establishment of a National Alliance to End Child Marriage and Female Genital Mutilation/Cutting (FGM/C) is another significant stride in the effort to end child marriage as it has been key in coordinating interventions. UNICEF supports the Government’s effort by strengthening the coordination mechanisms at different levels. Additionally, UNICEF is supporting the implementation of a multi-sectoral programmes in six regions: Amhara, Afar, Somali, Oromia, Gambella and Southern Nations Nationalities and Peoples region. The programme includes social mobilization to change attitudes and strengthen collective community action to end the practice. It also focuses on improving enforcement of the existing legal frameworks. To further strengthen and accelerate efforts to end child marriage and other harmful traditional practices and to bring about the necessary societal shifts in communities, UNICEF has also established strategic partnership with major faith based and civil society organizations. “Child marriage is a harmful practice, and I want girls to continue with their education like me,” says Mestawet. “I have seen my classmates quit school because they are married. I always tell my friends in my village about child marriage, and I will continue to do so to others”. Mestawet wants to become either a doctor or a teacher. It might be years before she realizes her dreams but in the meantime, she keeps protecting girls in her village, including her own younger sister, from getting married early. 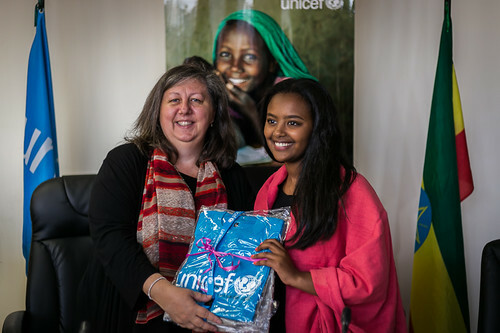 12 January, 2015, Addis Ababa: Today, UNICEF Ethiopia renewed its ambassadorship with seventeen year old Hannah Godefa, a citizen of Canada with Ethiopian origin, at a signing ceremony held at its premises. 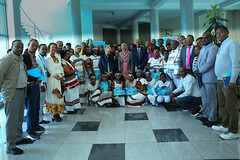 The event was attended by Hannah Godefa, UNICEF National Ambassador to Ethiopia, Hannah’s father Ato Godefa Asegahegn, H.E Roman Gebreselassie, Chief of government whip at the House of People’s Representative, W/ro Tsehay Bahta, Head of Capacity Building and Social Affairs Standing Committee of Addis Ababa City Administration Council, H.E Mr. David Usher, Ambassador of Canada to Ethiopia, Ms. Elizabeth Hailu, Manager Customer Services Ticket Offices, Ethiopian Airlines, Patrizia DiGiovanni, Officer in Charge of UNICEF Ethiopia, and members of the media. During her ambassadorship, Hannah has been engaged in numerous advocacy activities representing UNICEF-giving a voice to women and children globally. On these occasions, she has served as keynote speaker, a panellist and a moderator with high level government officials, business leaders and advocates from the non-profit sector. Her participation and contribution at the World Economic Forum in January 2014, with H.E. Mr. Ban Ki-moon, Secretary-General, United Nations, H.E. Mr. Paul Kagame, Co-Chair, MDG Advocacy Group and world leaders that focused on issues very close to her heart – innovation on investing in girl’s education – has been exceptional.